The heavy-duty Oki B720dn is designed for medium to large-sized offices. This unit has a monthly duty cycle of 200,000 pages and comes with built-in Ethernet and duplexer. Print speed can go as fast as 45 ppm for black and white output and the resolution can go as high as 1200 x 1200 dpi. The Oki B720dn mono laser printer runs on128 MB, which can be upgraded to 640 MB. However, it does not have Wi-Fi. 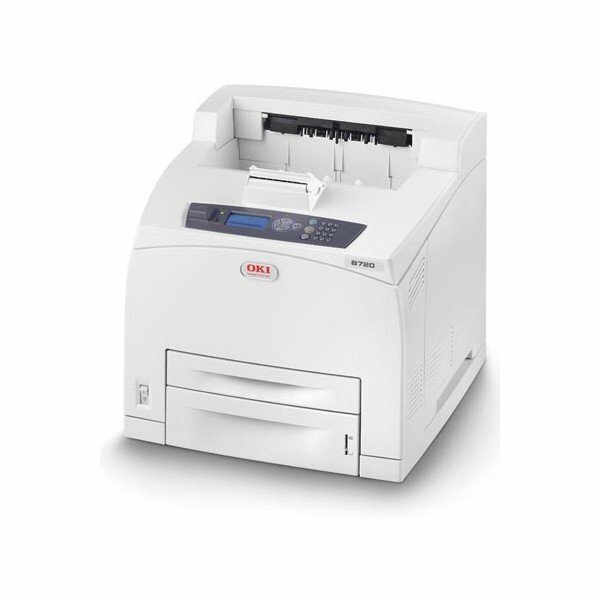 The Oki B720dn LED laser printer measures 404 x 422 x 572 mm and weighs 23.2 kg. It has 2 standard paper trays on the base that can handle 700 sheets. The addition of optional trays enables the Oki B720dn duplex mono laser printer to handle 1,800 sheets. For connectivity, there are parallel, USB, and Ethernet interfaces. The high capacity black Oki B720dn toner can print approximately 20,000 pages. The B720dn monochrome laser printer is efficient and reliable. It delivers good quality output at more than reasonable speed. The Oki B720dn has the convenient feature of a USB slot for thumb drives for direct printing. Other helpful features include an automatic duplexer for double-sided printing and Ethernet for networking. The Oki B720dn is easy to use and install. It is compatible with Macintosh and Windows computers. The Oki B720dn printer is a bit pricey. More users could access this unit if it had Wi-Fi. However, the Oki B-720dn does not offer this connectivity function even as an option.